Smile Moves has established an excellent reputation by offering high levels of service combined with great value for money. We fully understand that moving can be stressful and that everyone has their own individual needs. Our friendly team of experienced movers will make sure your move runs smoothly and to your particular specifications ensuring that you move with a smile. Call our friendly booking team on 0800 074 3060 for a no obligation quote or just fill out our quick enquiry form. I’m Simon Edney the owner of Smile Moves. I started my career in the removal industry back in 2006 working for a London removal company. I accumulated a vast amount of experience and knowledge of the trade and understood the important principles behind the removal business. In this company they had a good work ethos but customer service was not always a priority. After 2 years of working for them, I felt that I could do a better job so I decided to set up my own company, providing the best removal service at an affordable cost, always putting the customer first, and that’s exactly what I have done. Smile Moves is a rapidly growing family run business based in South East London, moving clients all around London, the UK and Europe since 2008. We have established an excellent reputation by offering high levels of service combined with great value for money. If you are looking for a trustworthy, reliable removal company to take care of all your home removal needs, then welcome to our website. We understand that moving home can be a stressful time for all concerned. We make it our priority to ensure your move goes as smoothly as possible. By having our carefully hand-picked team of removal professionals, we provide a reliable, professional and friendly service with a smile. I named my company Smile Moves because this is the removal company that takes the stress out of moving and puts a smile on your face. Used this website to find Smile Moves and I would thoroughly recommend using this service. Very good value offering, extremely professional employees, and trustworthy. They helped to make the whole process a lot smoother, and were efficient and quick in their work. Nothing was too much trouble; the owner even went above and beyond and delivered extra boxes and bubble wrap to us the night before when we ran out, which was very much appreciated. Look no further than smile moves to assist with your home move. Hardworking, head down, great attitude I would recommend these guys. They moved us from London to Somerset in 3 vans, 6 guys, no fuss no problems just a smooth transition. We packed ourselves but they provided packing materials, the perfect amount. Everything was placed in the correct rooms and beds and kitchen tables make up quickly and effectively Good prices compared to other quotes and we loved their can-do attitude. Thank you! We found Smile Moves fantastic. Easy to deal with, well priced and friendly. The two guys packing were polite, nice to have around and extremely hard working. They knew exactly what they were doing and really cared about their work. On move day everyone turned up on time and the team ran things like a well oiled machine. A great company, who live up to their name. We will and already have been recommending them to friends. I have used Smile Moves on a few occasions and couldn’t say enough great things about their service. Fairly priced, unbelievable careful and professional. They were responsible for packing all items of a fully furnished apartment, they meticulously packed each item and not one was broken. You can trust Smile Moves with anything, and they’re an absolute pleasure to work with! 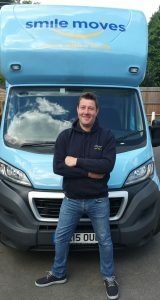 Simon, Norbert and team were brilliant from start to finish – the quote was very reasonable for a full packing and removal service. On the day, they were incredibly efficient and cheerful throughout. They arrived early. Everything was carefully wrapped and packed into logically labelled boxes which made unpacking at the other end easy. They also dismantled and reassembled our furniture, thoughtfully constructing our baby’s cot first so that we could put him to bed at his usual bedtime. I’d thoroughly recommend Smile Moves. We recently used Smile Moves to put the majority of our household contents in storage whilst we were doing some building works. They were an absolute delight to work with – they came and packed everything beautifully and took it away. The lorries came back last weekend with the same removal men who brought everything back. They were a pleasure to work with – good-humoured and very careful with all of our furniture. We have unpacked almost everything – no breakages whatsoever and all in perfect condition. I have moved (too) many times and I can’t recommend Simon and Smile Moves highly enough! © 2017 Smile Moves. All rights reserved. Site design by LD Studios.